All the currency markets waited nervously yesterday as Fed Chairman Ben Bernanke began his two day, ‘mid term’ report on the current state of the US economy, and the direction for FED policies in the short to medium term. Yesterday’s candle on the euro vs dollar daily chart reflected this sense of anxiety as the US dollar found some support from Bernanke, ending the session with a bearish shooting star pattern, a small body and deep upper wick, suggesting that we may see some reversal from recent euro strength, and a consequent fall in the pair. As always we need to wait for this signal to be confirmed in the next few days, and any reversal from here may only be a short term trend, with the euro dollar taking a short breather before heading higher. If this bearish signal is to carry any weight for our trading, then we need to see a break and hold below the strong resistance now in place, and only a move below the 1.38 price handle would be sufficient to confirm that the recent trend higher of the euro dollar is now over. 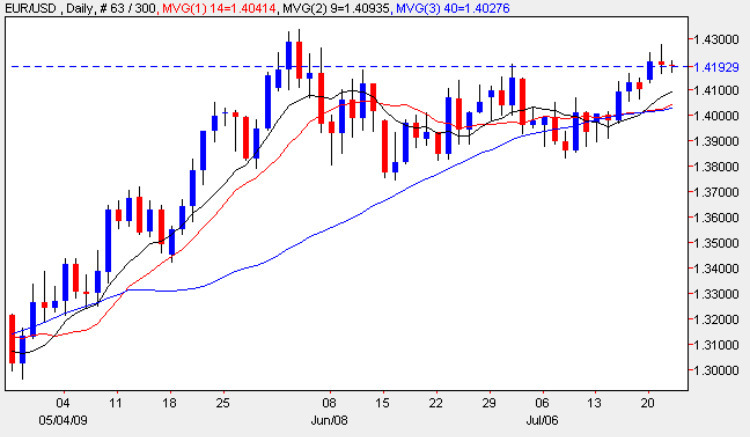 However what seems more likely ( give the state of the dollar index) is that any move lower may only be temporary, and may well find support either from the moving averages immediately below, or alternatively from the solid platform now in place at 1.41.Much will depend on Bernanke’s second day, and whether investors are seduced by his words into accepting risk once again with a consequent fall in the US dollar, or alternatively will they become increasingly alarmed, spooked either by the banks reporting today or the possible collapse of CIT. Either way we should find out later this morning as the New York session gets into full swing – in the mean time, the euro vs dollar will sit and wait!